Thank you, dear Lord Jesus, for sharing your heart with us. Please help us to be vigilant in prayer and faithful to respond as you have instructed us. Amen. My dear ones, I want to share with you a little about timing. There is a certain Prophet who was taken to the courts of Heaven in 2015 and was privileged to be present during the case presented to delay the Rapture. If you remember back at that time, I told you how very close we were. And that the Lord had told me 3 more years. A period of grace was extended by three more years in the courts of Heaven. I lost about 40% of my viewers and endured a great deal of ridicule over that. Thanks be to God. However, again the Lord spoke with me that He had again given another provisional extension of two years, right after all of us beseeched Him around Christmas time. My understanding was 2 years. I believe we have two more years of 'provisional' time before the Rapture. When I say provisional, I mean providing we pray very seriously, every day for our nation, our President and the world. And at the end of that time, if we have been faithful, another examination of the world condition will be made. So, I am working very hard believing I have another 2 years to serve Him. And that brings us to December of 2020. Many of you have been praying with all your hearts, and souls and strength, and much has been delayed because of your intercession, and will continue to be delayed. He has also told me that doesn't mean there will not be tragedies and trials. There will. However, our prayers will lessen the severity of these events. 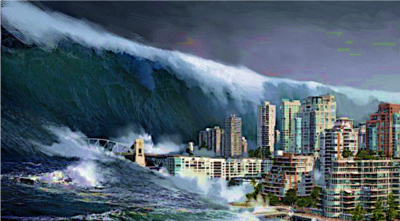 Today one of our prayer warriors and priests told me of her dream about a tsunami which is coming. We've all known for quite some time this was going to happen and the two locations we've been shown are San Francisco and New York City. It could be, I think, either one of those. Just now during dwelling prayer the Lord played a song from the Exodus album, "The First Plague of Water to Blood". Which I will follow up on this message. After that He chose that song, He picked Eden's Bridge's song "Eternal Father". If you've never heard Eden's Bridge before, they are a wonderful group. Extremely anointed and fabulous musicians. They stopped making music a few years ago, but oh, they're wonderful! So, this is a beautiful old hymn, Eternal Father. And to add to all of this, Ezekiel had a mega dream last night. A five-hour-long dream, where he and I were allowed to experience the entire flood episode, but from within the bodies of Noah and Na ah ma, Noah's wife. Wow! That was fascinating. I don't remember that encounter, but Ezekiel gave me the run down on it this morning. One of our sons was in it, as well. Not aboard the ark, but somehow preserved from drowning and came running back to us after the water receded. When we were closing the ark, he ran out and climbed a cliff overlooking it. He did not come with us, but somehow later he was spared. This is one of our sons who has been holding God at arm's length, due to some tragedy in his life. Also, aboard the ark were my pets from Heaven, Simba the white tiger and Judah the male lion. But they were just cubs during this time. When the ark settled and the water withdrew, the first thing we did after we left the ark was to bow down on the Earth and kiss it, giving thanks to God for our survival. Already at this time there were tiny shoots of grass coming up, maybe 2"-3" tall. Also, Jesus was in this dream, in a boat with many children from age 7 on down. He had rescued them from the water. So, how do I interpret this? Good question! I believe the Lord is warning us, Heartdwellers, that we may very well have a catastrophic tsunami in this country in a big city. The narrative from the second episode of the prophet who was present in the Heavenly Court, mentioned that there would be natural disasters. And dear ones, the Lord has always promised us that if we prayed, He would lessen the tragedies. And here I want to present the prayer that St. Faustina taught us from the Lord. Jesus told her, "If you say this prayer, with a contrite heart and with faith, on behalf of some sinner--I will give that soul the grace of conversion". And this is the prayer: "O Blood and water that gushed forth from the heart of Jesus, as a fount of mercy for us sinners, I trust in You"." Please, remember this prayer dear ones. We may have to be praying this over thousands of souls. So, in prayer I felt these three signs today were a warning to you from the Lord. Jesus have you anything to say? "My Faithful Brides, how proud I am that you have pierced the heavens with your cries and entreaties. Only when you are with Me will you see the fruit of your labors, your obedience, your willingness and love. It is true that chastisements will be allowed for a season, but it will be for the punishment of the wicked and those caught in the grips of it who are not wicked, such as innocent children. I promise them a swift ride into Heaven and eternal delights. "But for you who are left, there will be much work for you to do. There will be revival and a turning back to Me, and in this way I hope to prepare My Bride so that soon we will be together. Getting the attention of My Brides to be has been a serious effort with little fruit except in countries who have experienced terrorism, displacement and tragedy. "Sometimes that is what it takes to separate a soul from the world and seriously consider that I am real, alive and calling to them. "Souls that respond to Me without having to go through this are precious few and far between, and My heart longs to lavish love and consolation on those who are yet to experience Me. But they are naked and blind in this world, and their very reality must be shaken. There is little time left and they are lagging behind. That is why more serious measures are needed to get their attention. "However, I am never without pity or mercy, and I hate to experience their suffering and to feel what they feel. So, I try with all possible measure to draw them to Me by life's ups and downs. "But when a people is so enraptured with the world, more dramatic and harsher methods are needed. "I am asking you all to stand on the wall of intercession...looking out over the world and giving your heart to those who suffer and are victims of tragedy. I am asking you to respond to that still small voice within you that calls you to prayer. "I am asking you also to know that your loved ones are in the hands of a loving and just God, and nothing happens without His consent. Trust Him. Trust His faithfulness and give Me great cause to trust you with the most precious thing in My world: a human soul. "Trust that I know what I am doing and allowing, and in the end, there will be a glorious re-uniting with your loved ones. Trust and offer your sorrows to Me, and I will bring great joy at the appointed hour."